Meet me at San Diego Comic Con 2012!!! AHHHH! My hair is on fire right now, I’m so behind. Right now I’m packing everything up to take to Comic Con. I leave tomorrow morning! Sadly my new posters aren’t making it to the convention but I will have a very limited quantity of my new art book Mystery Pets and a new sticker sheet! I will also have a new shirt design for the convention. I really wanted to get some other stuff done including this post earlier in the week but as typical of me everything is put off until the last minute. I will be in the Small Press Pavilion, Table N-05. 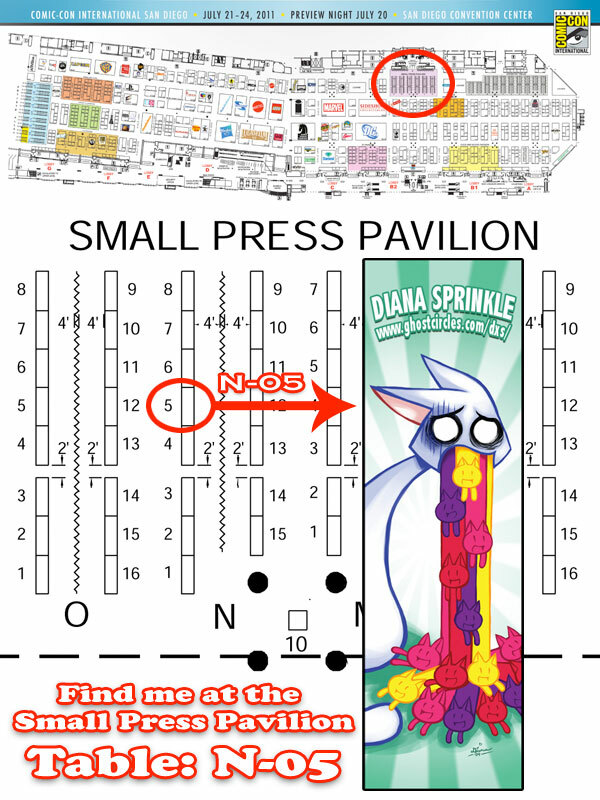 Please come by and poke me if you’re going to the con. I’m in the same area I was last year so hopefully I’ll be easy to find. Filed under Conventions, News |	Comments Off on Meet me at San Diego Comic Con 2012!!! Woooo, Comic con is fast approaching! And as my final convention of the summer season, it’s freaking me out a little. LOL I don’t know why I’ve been going to the stupid thing since 1994. =P Anyway this year I have my very own table to sell my work at, so I’m very excited about that. Anyway here is a map of where I’ll be in the giant huge San Diego Convention center of Doom. 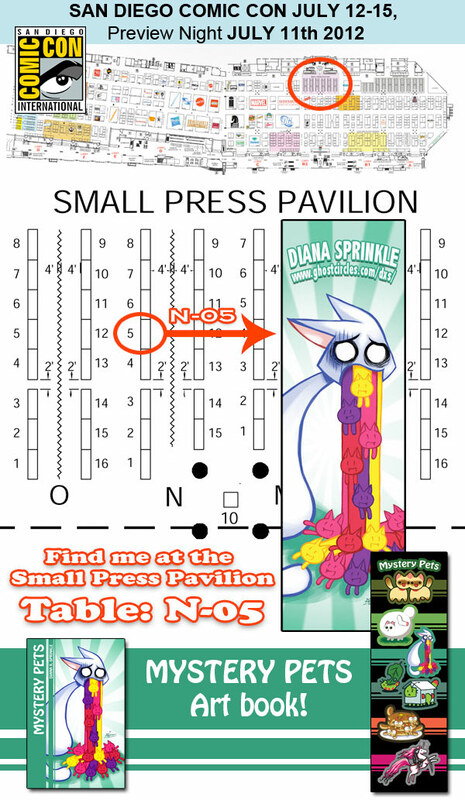 My table is under the name “Diana Sprinkle” and is N-05 and I’ll have a giant banner of my puking cat behind me. So hopefully I won’t be too hard to miss. =P Stop on by and say hello! I’m also going to have stuff in the art show. I’m so excited. So I have Staple this weekend and that’s going really well. It is also going to be open on Sunday this year which is awesome. It’s in Austin Texas at the same venue that they had Blue Genie in. I like the comic crowd a lot they seem to want to read things and really like cats. Then while trying to get some out of the closet and finally get some sleep I cut myself on some glass. Right on the back of my hand on my middle finger. Ugh! I had to wake up my mom to help me put some wound closure strips on it. Hopefully I can get people to help me move the stuff at the end of Staple into my car. I don’t think I should be moving my hand much and of course it’s the right hand. I think I can still draw and write… tests it out. One day left! Threadless is offering T-shirts for 9 bucks each. I’m kind of bummed that all of the shirts I want are still out of stock or currently not a color I like. But I thought I’d share the sales page if any of you guys out there wanted a shirt from Threadless at half off. This weekend was sort of crappy, most of my plans fell through. I had to cancel going to AnimeFest which sucked but was probably the best thing considering the emergencies that cropped up. Sorry to anyone who thought they be able to bump into me. I was really hoping to be there. One good thing that happened though is they extended the gallery show I’m in. I currently have some of my art for sale at the Hideout Theater/coffee house downtown. All the art is going to be up for September as well, so I extended my area and put up some more art. Please check it out if your in the Austin area. I wish I didn’t have such a hard time focusing. I feel like I have too many things to keep track of but I have plenty of time I’m just bad at organizing myself. It’s really frustrating. I am however starting to reorganize my living space. Which is a good step forward. So I have things that I need to get rid of. *FIXED* I’ve been hitting my head against the wall here but why are the titles to the items in my shop showing up next to my images instead of actually under them? Someone who uses CSS more then me, please save me. It wasn’t like this until I updated WordPress and now I can’t figure out what part of the code needs to be murdered. Maybe I just need to get a more current theme or something but I still want to know whyyyy. Hates. Also the shop part of my site has a different font for no reason I can see. It’s using the exact same theme as my main site but the fonts are different? Why? Edit: Really? Really CSS? “Display: block;” is what i was missing? Why did I have to put it on all the link attributes in theme?? Even on Hover? I’m figuring there’s a overall link thing I should have added it to but hey it works! I will not look a gift horse in it’s mouth. I did manage to fix the new products part of the front of the shop so that the next page bits actually work. Which was frustratingly easy and yet completely unintuitive maybe even unsatisfying simple. I survived Anime Overload and I sold a chunk of the manga/artbooks/crap from my room that I brought there. I still need to move more of it so I hope to post a list of stuff here for you guys. I have high hopes that you fine people may want this stuff and I can send it far far away from me. They asked me if I wanted to come back and I wasn’t sure. On one hand I never want to move that much stuff into my car and down the road to a convention center in the middle of the Texas heat. On the other hand I sold about 30% of the books/toys I brought. On the other other under hand, dear god please no, also 30% was probably most of the good stuff people there would ever want. I have the strong desire to shove the rest of my manga in a dumpster but the effort is probably too much. Right now boxes of it are downstairs looking accusingly every time I go down there. They are waiting to go back in my room where they will box me uncomfortably into a smaller and smaller space. Help. Oh my god. I’m covered in manga and comics. I’ve been clearing out my shelves tonight trying to figure out what I’m going to be selling at this small Austin anime convention this August. I bought a dealers table so I could sell off used manga and comics along with my normal artwork. And I don’t think there’s anyway I’ll even have enough table space for all of this stuff. I’ve covered a bed in books and a chair in art books and I still have 2-3 large boxes on the floor and I haven’t even touched the doujinshi stacked in the corner of my room. I’ve been collecting this stuff since before 1995 and was only able to sell some of it at A-kon before they made it so you couldn’t sell this stuff in Artist Alley. This is like a fire sale type situation. I already did like 3 runs to Half Price Books at the beginning of the year so it’s slightly crazy to still have this much stuff. I’m really afraid of what will happen when I do clear a path to my comic collection. That stuff is getting sold away if possible. I really need to just get rid of this stuff. I need more space and I’ve got to get a handle on my collecting because I’ve built up a lot of stuff. Is anyone looking for anything? New or old, lord knows I might have it. I might put up a list or photograph the spines of this stuff. More likely I’ll probably take the lazy path and just make some grab bags for the convention. Also does anyone want Hello Kitty or random journals for cheap (like 3 for 8$)? I have a ton of them lying around empty because I love buying pretty/cute journals and I always THINK I’ll write in them and to be honest I just don’t. Sure here and there I start one or two but most of the time they are just in my room looking pretty and gathering dust. My birthday was last week and I forgot to mention it because I’ve been struggling to get ready for all of the conventions coming up soon. I’m not really prepared for the cons but I have so much new art that I think I mostly just need to make sure everything is printed up and ready. Though I could use a few more painted pieces like the Pancat and the House Mouse to go with all of the flat shirt colored art I now have. Speaking of shirts I may have one of my designs up for sell in the next few weeks. I’m just waiting for conformation that it’s going to be printed and what day it’s going to go up. Oh man, I have this super big blue and white cat stripe painting. And last week I finally set up a space in the garage to seal the thing and a huge thunderstorm rolls in and totally ruins it. Well some of it was my fault but I don’t think I caused it to buckle and warp. I blame the heat and humidity. I sort of freaked out because that has never happened before with any of the other images. I was really upset and sad but I figured I’d just go ahead and keep putting the sealant on, it needs about 3-4 coats to really get everything covered right. It ends up with a nice glossy shine once everything dries and it looks amazing. So, I dishearteningly finish the sealing hoping that since it’ll be under glass that no one will notice the rippling. I brought it inside 4 days ago and what do I see today? The damn thing isn’t warped anymore. What? Was it playing a game on my emotions? Shakes fist at own painting!!! I have no idea how to scan it. It’s really large. I might do it in pieces that is if I want to hate myself. A-kon: June 2-4th in Dallas. I have a table in the Komik Market and art in the Art Show. Anthrocon: June 24-27 in Pittsburgh, PA. I’ll have a table in the dealers room and art in the Art Show. San Diego Comic Con: July 21-25 in San Diego. I’ll be sharing a booth with my friends and will have art in the Art Show. I’m going to be hitting some other smaller conventions in the Texas area after summer but I’m mostly excited to see how things go for these main three. Sales have been picking back up on my art in the last year so I’m hoping that this trend will continue to grow. Which reminds me I am the worst person about updating my site other then my weekly stabs at the derby. I’m hoping to fix that before A-kon with at least a new site theme. I need to overhaul the entire site but that might have to wait until after the convention season. Just to liven up this journal! 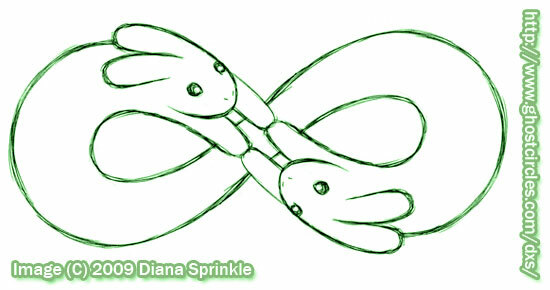 A piece of art I’ve been working on, Bunnies 4ever or Infinite bunnies. It’s like my stripe cats only it’s bunnies and it’s not a stripe across the page. I sort of want to make a real painting of this but I’d need something to transfer the image onto the canvas/board. Hmm. Anyway! I’ll post a finished computer colored version when I’m done. Lots of stuff! Staple! LOLmart! Paintings! Derby! I just finished a huge cat stripe painting and I have no idea how I will seal the thing. It’s 20″ x 30″ and light blue. I have a huge table that I can lay it out on and drop cloth to protect the floor but nothing big enough to cover the painting so that I can keep the cat hairs off of it. Stupid cats. I might need to buy a bigger can of sealant too and some large brushes to really cover this thing quickly so that I don’t have brush strokes showing up on it. Might need to go talk to an art store person who knows what to do just to be sure I don’t mess up my image. Staple! was pretty cool. Me and Shawnna didn’t get much sleep before the con and we were sort of late to set up but it was a nice relaxing convention. Sells weren’t great but I think it helped me figure out how much to charge for my tiny paintings. I sold mostly the ones with bunnies on them, which I thought was weird until mom reminded me that Easter was coming up. I’ll put up a chunk of the remaining paintings on Etsy. I’ve been wanting to try that site out for awhile now. I’ll put them also up as small prints because I think they are adorable. I’m trying to be better about scheduling my work. I always feel so listless since I don’t have a job that I get up and leave the house for, so I end up keeping terrible work hours. So, I’m trying to make myself follow these guys awesome schedule. I work really well to it, I just tend to fall off the horse if I don’t watch myself like a hawk. Tomorrow I’m going to be working on getting some of my old Woot designs cleaned up and submitted to other sites. Then I plan to make a bunch of these random shirt ideas that I’ve been thinking about but have been too distracted to get to. Lots of puns and cats! Only the top 3 shirts will get made into shirts. Click on the link and hit the “I want one” button on Shirt Woot. Oh and voting ended on this shirt but I forgot to post the shirt I did for last weeks Derby: The New Vintage. Filed under Animals, Art, Conventions, News, Original Art |	Comments Off on Lots of stuff! Staple! LOLmart! Paintings! Derby!